Commercial toothbrushes have been around since 1780 when William Addis of England drilled holes through a cattle bone and passed pig hairs through them to create a device to clean his teeth while he was in prison. It’s no surprise that our options for taking care of our teeth, and the teeth of our children, have only increased exponentially since then. If you take a trip down the pharmacy aisle at any market today, you’ll be bombarded with walls of toothbrushes. Manual, electric, soft bristles, hard bristles, different bristle patterns, and several types of head shapes are just a few of the options you might spot. 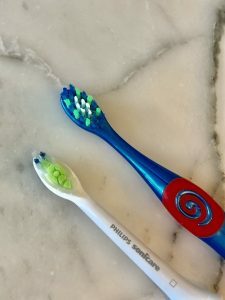 So how do you decide which brush matches your child’s dental needs and, just as importantly, will motivate them to brush twice a day? Here’s a few things to keep in mind the next time you need to pick out a new children’s toothbrush. The Cochrane Review found that electric toothbrushes reduced plaque by 21% when used for at least three months when compared to manual brushes. However, other studies have shown that there’s no difference in outcomes for patients using the two types of brushes. The jury’s still out on which type will provide better protection against tooth and gum disease. Our office recommends that parent supervision is required when your child/teen uses electric toothbrushes until they are about 9 years old. Children tend to neglect the inside of their teeth where their tongues lay and this area needs special attention. Many electric toothbrush models light up or play a tune for the two minutes of recommended brushing time. If that’s something that causes your child to look forward to brushing their teeth, then an electric toothbrush is worth the investment. Alternatively, if your child is drawn towards a manual brush with their favorite superhero or Disney character on it, the extra boost of having a toothbrush with a design they love could be the extra push to brush twice a day. Manual toothbrushes offer more control over the amount of pressure applied, which can be helpful if your child has sensitive teeth and gums. Additionally, children may have less control over an electric toothbrush, which could come programmed with only one setting. Applying too much pressure can also cause gingival recession, also known as receding gum lines. Electric toothbrushes tend to be more expensive than manual options. If you do the math, you’ll find that a manual brush will save you an average of $60 per year assuming you purchase a new brush head every three to four months. As always, your child’s pediatric dentist is there as a resource for you to help you navigate through the various options. Consider your individual child’s needs in conjunction with their oral health next time their toothbrush needs replacing. We’d love to hear what works for your child or teen – manual or electric toothbrush? Let us know in the comment section below. For more useful information about children and teen dental health, subscribe to our monthly newsletter here.